For every band that's become a success over the years, selling records and touring to packed houses, there have been many more that haven't made it. It's always been a gamble for record companies to get behind a new band that might or might not take off, but the odds are better with some than others. This week in 1986, a band that was almost guaranteed to be successful debuted on the ARIA chart with their first single. Given the musical pedigree of its members, expectations were high - and they did live up to them... eventually. A person few would have expected to score a number 1 single was in exactly that position this week in 1986. Samantha Fox held on to the top spot with "Touch Me (I Want Your Body)" for a third week. Australia's Western-themed rockers reached the end of their chart career with this fourth and final single from Highlights Of A Dangerous Life. I'm a big fan of this UK and US top 20 hit by Scottish band Hipsway, having come across it in recent years. In 1983, it failed to make much of an impression in Australia. Even though it feels to me like The Angels had a new single every other month in the '80s, it had actually been more than a year since they'd last been in the top 100. And, they came back with a vengeance. The lead single from Howling, "Nature Of The Beast" performed better than their singles had in a while and returned them to the top 30 for the first time since 1983. It'd been five years since Devo-mania had swept Australia - and what a quiet five years it had been on the Australian chart for them. 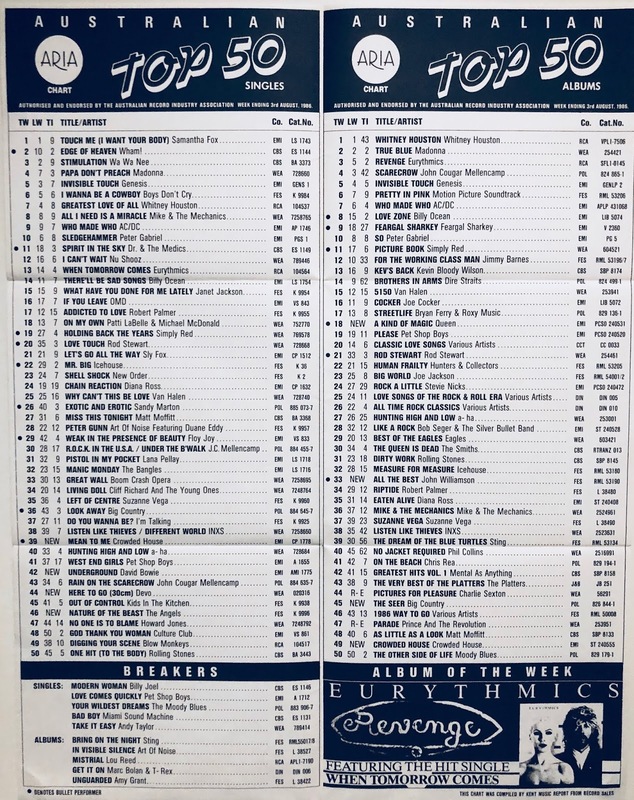 Even though they'd kept releasing music since their three hits of 1981 (DEV-O Live, "Working In The Coal Mine", "Beautiful World"), nothing had peaked higher than number 45 (1982's "Peek-A-Boo!"). Was it all over for the men in flowerpot (actually, "energy dome") hats? Or could a new single from a new album rekindle the public's interest? Well, given that album, Shout, actually came out in late 1984 (but missed the top 100) and it took until August 1986 for this single to graze the bottom of the top 40 in Australia, things weren't going so great for the band. As a result of the poor performance of Shout, Devo were dropped from their record label and abandoned plans to tour in support of the album. Last time we saw David Bowie on the ARIA chart it was with the theme song from Absolute Beginners, a film he appeared in. His next single was also taken from the soundtrack of one of his movies - this time, fantasy film Labyrinth, in which he played goblin king Jareth. I don't think I actually saw Labyrinth at the time and "Underground" is only vaguely familiar to me, but I recall another song from the soundtrack, "Magic Dance", much better, even though it wasn't released as a single in Australia. After a few years spent on various one-off projects, David got back to releasing studio albums in 1987. I wonder if Crowded House would've been as successful if they'd stuck with their original name: The Mullanes. Probably. 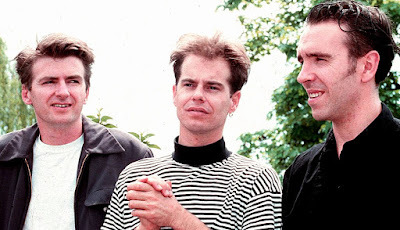 Whatever they were called, interest in the new project formed by ex-Split Enz members Neil Finn and Paul Hester was high given the nine top 20 hits their former band had amassed between 1977 and 1984. Once the line-up was settled to Neil, Paul and Nick Seymour, the younger brother of Hunters & Collectors' frontman, Mark Seymour, the band became Crowded House and recorded their debut album in America. Things didn't exactly get off to a flying start, however. Despite being, for me, the best song they ever released, debut single "Mean To Me" was only a moderate hit and the accompanying self-titled album wasn't an immediate success. 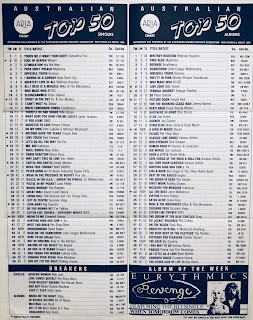 Crowded House spent the first 25 weeks of its lengthy top 100 chart run not getting any higher than number 25. As we'll see in coming months, things would get worse before they'd get better... but they would get considerably better, justifying any assumption in the band's ability to sell records. Next week: new singles by two of the biggest American male artists of the mid-'80s. Plus, it's the final week of the large-format chart. Never heard The Johnnys' song, but it's quite good for their genre. It seemed unlikely that Devo would score a top 40 'hit' in 1986. I was quite surprised when I first learnt of this; let alone it being a dance 12" single. 'Whip It's Oz chart peak is surprisingly low, too, given that I knew the song when it appeared on a Chipmunks record I was given, aged 3. I guess it was used to promote the 'Devo Live' EP. I saw Labyrinth at the movies (not really by choice) that year, but don't recall the music (or anything else really) from it, other than David's zany hair and look. The 'Woodface' and 'Together Alone' eras were my favourite Crowded House eras (minus a few of the singles); I'm less fond of their 80s stuff, generally.